Environmental Toxins Make You FAT And Cause DIABETES! My name is Yuri Elkaim. I'm a registered holistic nutritionist, renowned health expert, and the New York Times, WSJ, and USA TODAY best selling author of The All-Day Energy Diet (Hay House, 2014). Over the past two decades I've helped more than 500,000 people to incredible health and vitality with simple shifts and making the complex world of health simple. Nerve Poison, Every Single Day! Probably Drinking Nerve Poison Too! Chronic toxicity, leading to… impaired memory and concentration… disorientation… severe depression… irritability… confusion… headaches… insomnia… nightmares… nausea… and a general feeling of weakness, and exhaustion. And for children, chronic pesticide toxicity also leads to… delayed learning rates… reduced physical coordination… and development and behavioral problems, including ADHD. 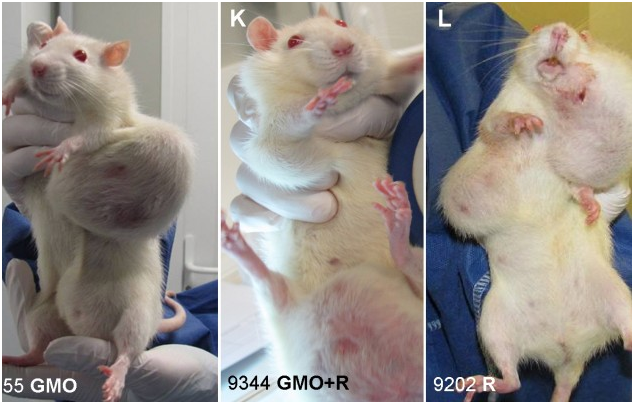 This is all documented in Extoxnet’s “Pesticide Information Profiles” report. In fact, a 2011 study published in the Environmental Health Perspectives journal revealed that people exposed to two particular common pesticides are 2.5 times more likely to develop Parkinson’s disease. Another study has linked pesticide exposure to increased risk of Alzheimer’s disease. What’s more… the National Academy of Science estimates that between 4,000 and 20,000 cases of cancer each year are caused by pesticide residues in food, in allowable amounts. Clearly, Environmental Protection Agency controls are not protecting you or your family. And we’re still just talking about pesticides here. What about artificial food additives? They’re found in almost all packaged food products. Corporations use them to enhance shelf life, and make their products look, smell and taste more “perfect” — and, of course, to drive profitability to the max. Family — Even Though It Causes Cancer! Too Much For Your Liver! 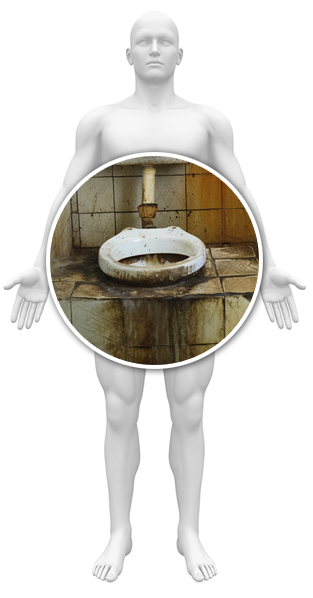 Every toilet is overflowing with sewage, which is leaking through the carpets and floors. All the bins are surrounded with flies, and the garbage is spilling all around the floor, and being trodden around the whole house. And every day, it gets worse and worse, because the waste is piling up faster than it can be removed. It will help. But it’s not enough. Because all those years and years of piled up rubbish inside your body is still trapped, and it’s still leaking into every inch of your body, infecting all the tissue and muscles. It all needs to be flushed away. The toxins have to be removed. And what about all those “Hollywood” detoxes… which you’ve probably seen on television, or read in a celebrity magazine? Or those magic detox pills… or “spicy lemonades”… or herbal cleaning shakes? Sure. They do flush toxins from your body — at least for a little while. But they’re mostly unsafe and definitely unhealthy. And they provide absolutely no nutritional value. And so, eventually, your body will force you to ditch them. They are simply not sustainable. Coming Back Again With A Vengeance! Eating Most Of Your Favorite Meals! You don’t have to cut them out of your life completely. Yes, it is true… to begin with, for the first part of the detox, you will need to stick to my plan and cut some types of food out of your life. But after the first phase of the cleanse… you’ll be able to reintroduce your favorite foods, and find your own balance that allows your body to stay healthy and free of toxins. There’s really nothing to stop you from trying this. But if you don’t clear your body of all the toxins and chemicals that have been piling up, then the problem is only going to get worse. You’ll continue gaining fat, and putting on more and more weight. And here’s why. Your body needs to store these dangerous excess toxins somewhere; otherwise, they can lead to serious damage in your blood vesels and vital organs. But since it can’t flush them out of your body completely… all these dangerous chemicals end up being stored in your fat cells, which act as storage lockers. That’s why, no matter how much exercise you do, or however much you cut down on what you eat… there’s always that extra layer of fat you can never shift. Your circulatory system will become ripe for heart disease. Toxins cause chronic inflammation — which, as you may know, abrades the inside of your artery walls. And it’s this process that is the real cause of heart disease, heart attacks and strokes. If They Can Do It...So Can You! Kristine Thom from San Diego, California used to be obese. (She’s 5’ 7” tall, and used to weigh 170 pounds.) Her cholesterol level was sky-high, and she was always feeling drained — and for no apparent reason. Then she started the Total Wellness Cleanse™, and lost 11 pounds within one week! And by the end of the Cleanse… she’d lost 19 pounds… her blood pressure was back to normal… and she was jumping out of bed every morning before the alarm! Jennifer Ripa-Edson from Ridgebury, Connecticut used to suffer from frequent headaches and acne. Two things that are seemingly unconnected. She was also overweight. But after completing the Total Wellness Cleanse™… she lost 10 pounds... an inch from her waist… and two and a half inches from her hips. And when an old friend saw her for the first time in months, she said that Jennifer has the skin of a teenager! Marisca Fourie from Centurion, South Africa had been suffering with her colon and sinus for years, and taking all kinds of medication that didn’t help. 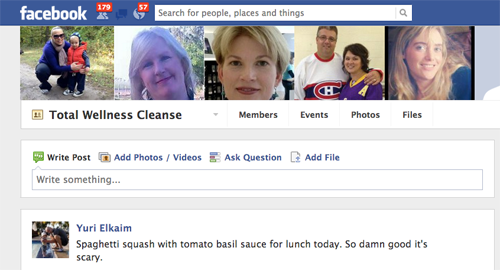 Yet, two months after starting the Total Wellness Cleanse™, she’s off chronic medication for good. Even better, she’s also lost 9kg… and has unleashed a torrent of new energy and enthusiasm for life! 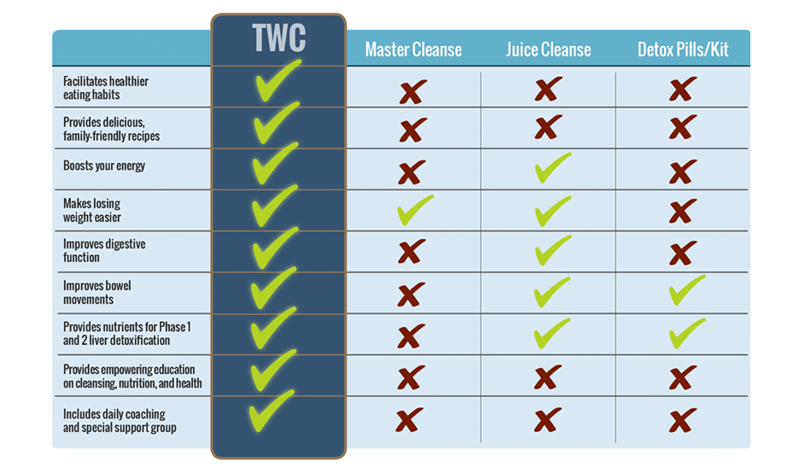 First, you have to know that the Total Wellness Cleanse is the only food-based cleanse on the market that also gives you daily support and empowered education. In other words, it’s the only detox program that lets you eat delicious, wholesome and nutritious foods… while working behind the scenes to clean your body of all the junk that’s been piling up in there all your life. There are no expensive supplements. No expensive “detox” potions, that leave you gagging. No colon irrigations. No “spicy lemonade”, or any other celebrity nonsense. And absolutely no dangerous long-term fasting stints. The Total Wellness Cleanse™ is all about eating delicious, whole foods that nourish your body with the vital nutrients it needs to kick-start it’s own natural detox process. And it’s this process that restores your health — from the inside out. It’s the same program that’s been tried and tested by 21,379 people to date, from all around the world. We’ve tested it, over and over and over again. And the results speak for themselves. This program will empower you to… finally save your body of all the dangerous toxicity that’s been polluting it for years, making you sick and exhausted… evaporate suborn fat… and unleash a torrent of sustainable all-day energy. Listen. The Total Wellness Cleanse™ isn’t about “shocking” your body into health, or starving it of all the nutrients it needs to function properly. This kind of thing isn’t sustainable. And in the long run, you’ll just end up wrecked, worn out and frustrated. Look. Take a walk down the aisle of any supermarket, and you’ll see a true horror story. The disgusting “man-made products” that gets passed off as food is truly shocking. And it’s no wonder the rates of disease, obesity and depression are rising rapidly. Just look at what people are putting into their bodies! Sorry. But I refuse to accept this as “normal”. That’s why I became a holistic nutritionist, and decided to devote my life to helping people like you reclaim their health the natural way. Up until my early 20s my diet was atrocious. Somehow I survived on copious amounts of processed foods, breads, cereals, pastas, and sugary treats. Although I survived, most of my childhood and teenage years was marked by low energy, embarrassing eczema, and terrible asthma. But it got even worse when my health took a big plummeting turn when I was just 17 years old. Out of the blue, in my senior year of high school, I started losing my hair. Within about 8 weeks, all of the hair on my body was gone. Everything! As you can imagine, going to my prom looking like a chemo patient wasn’t the easiest thing to do. I was diagnosed with an autoimmune condition called Alopecia but for more than 7 years, no medical doctor gave me a sufficient answer or solution to this problem. It seemed as though cortisone injections were their only “fix”. Thankfully, all of that changed when I went back to school to study holistic nutrition. Almost immediately, I realized that my hair loss (and my other health problems) were mainly attributed to my poor diet and years of toxic build up. So, I decided to do something about it. I cleaned up my diet and, as a result, my body’s internal wasteland got cleaned up as well. Miraculously, within about 6 weeks, my hair started coming back. I couldn’t believe my eyes. Several months later I had re-grown all of my hair. More importantly, I had more energy than ever and my eczema and asthma have never bothered me since! To this day, I keep my head shaved because it’s my claim to fame but the moral of the story is that if I could reverse an autoimmune condition by cleaning up my diet and thus my body, just imagine what you could do. Stubborn weight can vanish. Energy can soar. Skin starts to glow. After all, how you heal anything is how you heal everything. In fact, I was so blown away by my own transformation that I figured there must millions of people out there who could benefit from my experience. And so I decided to experiment on my personal clients… and guess what? They experience profound health improvements in the space of a few days! Add all of these body–transforming components together and that’s more than $338 in retail value. The good news is that you won’t pay anywhere near that when you get started with the Total Wellness Cleanse TODAY. "The Most Life Changing Decision I’ve Ever Made For Myself!" "Thanks for a wonderful 30 day cleanse, this program was wonderful, well organized and full of information"
"I'm eating so much better. I'm at my goal weight of 135 pounds (from 152 lbs) and maintaining it. I've lost close to 20 inches!" 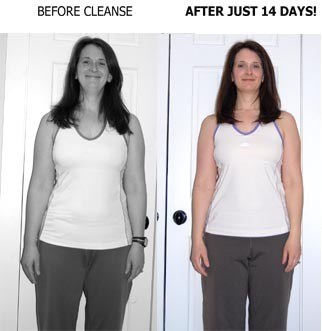 “I'm very appreciative for having been able to participate in the Total Wellness Cleanse. It has helped me get that jumpstart back into feeling better overall. Before the cleanse, I'd fight the alarm clock, dread the gym, eat "ok." Now, I wake up feeling refreshed ready to start the day. I head to the gym on routine now at least 4 times a week. I'm eating so much better. I'm at my goal weight of near 135 pounds and maintaining it. I've lost close to 20 inches. "This is truly the most spectacular health program to hit the market!" “I have received the best education I've had relating to these toxic topics, as well as the knowledge and awareness on how to change my eating habits and keep my body clean. Throughout this course, I had the support of Total Wellness Cleanse team day and night. I experienced their commitment to me, and I was very comfortable asking any question regarding any topic. "I lost 17 pounds in 3 weeks and went from 24% body fat to 21%…"
"Thanks to the Total Wellness Cleanse, I eat differently, I have no more cravings, I'm more conscious about my health, and I'm in full control of my health"
My skin is now so much clearer... and it looks younger! My digestion works better and I never feel any distention anymore. I feel more energized, optimistic and in love with my life. But the most important changes occurred in my mind. I've had sugar cravings for, at least 10 years, and, as can you guess, I became fatter and fatter. In less than 30 days, I lost 6 kilos and a trouser’s size. "I lost weight, dropped clothing sizes, got rid of my candida problem, lost my massive sugar cravings and learned how to eat well"
I am so proud of myself and thrilled to have had the experience that I can't just keep it to myself. So go for it!!! You won't be disappointed. "I easily lost all the weight that I wanted to (15 pounds) in the first 3 weeks... and I dropped 90 points in my overall cholesterol!" 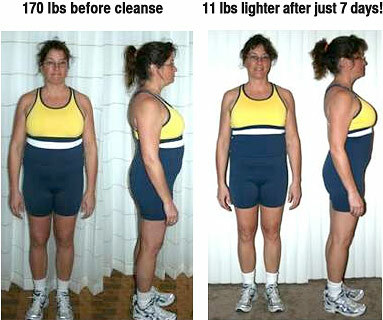 “My results on the cleanse were strong all around. I easily lost all the weight that I wanted to (15 pounds) in the first 3 weeks. Combined with daily exercise, this is the earliest in the year I've ever felt in top shape, so my energy is maximized. Medically, before the cleanse I was given a prescription for high cholesterol which I never filled. Needless to say, I dropped 90 points in overall cholesterol, avoiding the need for meds. The loose bowel issues I've had for the better part of the last year are gone. I have also not had one headache over the last 3 weeks. "I lost 24lbs during the 30-day cleanse… My complexion is better and I'm not getting any more of those wicked hypoglycemic headaches!" “First, thank you for all your hard work in putting the cleanse together and for all your support throughout. I really enjoyed learning about the ways various foods affect my body and the whole physiology of blood, organs, digestion and elimination systems and you've provided a wealth of information I can keep referring to. I lost 24lbs during the 30-day cleanse. I feel great in my body. My complexion is better and I'm not getting any more of those wicked hypoglycaemic headaches. "I have been off chronic medication since I started the cleanse and trust that it is now something of the past"
"A friend who hadn't seen me in a while commented that I have the skin of a teenager. I lost 10 pounds, an inch from my waist, and two and a half inches from my hips!" I have far fewer headaches, my skin is smooth and acne free. A friend who hadn't seen me in a while commented that I have the skin of a teenager. I lost 10 pounds, an inch from my waist, and two and a half inches from my hips. Order Today And Get These Bonuses For FREE! And to help you even further, you'll also get the following bonuses that will ensure you stay on track and reach your goals in 30 days or less! BONUS #2 Access To Our Members-Only "Cleanse Group"
Thankfully, you can discover how to rebalance your "gut flora" inside the "Ultimate Gut Health Guide". In it, you'll also learn ho to make simple gut-friendly foods from the comfort of your own home and for far less money than the cost of an average probiotic supplement. This guide is valued at $47 but it's yours FREE (and only for today) when you grab the Total Wellness Cleanse. These bonuses are yours for FREE - and only TODAY! Tearing Your Cells Apart Right Now! Sustainable Energy, And A Slimmer Body? In 2009, we ran the Total Wellness Cleanse™ as a live event, for my personal clients who couldn’t justify my private coaching fees. It cost $997 to take part, and even then, that was a half-price introductory offer. But you won’t have to pay anything like that. I’m on a mission to help 10 million people to amazing health by 2018. And I can’t do that if I charge you what charged my in–person clients ($997) for this very program. There’s just one hitch - you must promise to share your success story with us! Those are incredibly motivating to others and help us spread the word as far as possible, getting people off the detox pills, free from their cravings, and into something that actually produces results – – quickly and safely. Q: "What makes this cleanse different from all the rest?" That should be pretty obvious by now. There is truly nothing like our cleanse anywhere! Not even your local naturopath or nutritionist can provide you with the tools and support that you'll get with our program. The Total Wellness Cleanse is the ONLY 100% FOOD-BASED cleansing program on the market supplying you with 10 weeks of meal plans and 119 whole food-based cleansing recipes. Sure there are plenty of detox pills and supplements out there, but if you're looking for lasting change and are serious about dramatically improving your health then this is it. This is only cleansing diet that will give you daily support via email, our Cleanse Group on Facebook, and through hours of our pre-recorded teleclasses. We're at your side 100% of the way to keep you motivated and on-track. Q: "What do I need for the cleanse?" Other than food and water, you don't need much. A blender and juicer are helpful but are not required. A food processor and a standard oven and cooktop will be needed. Q: "What am I allowed to eat during the cleanse?" Pretty much any plant-based food including vegetables, non-sweet fruit, legumes, non-glutenous grains, and nuts and seeds. Our goal during the initial 14-day cleanse phase is to give your body a break from the foods that impose unneeded digestive and systemic stress. 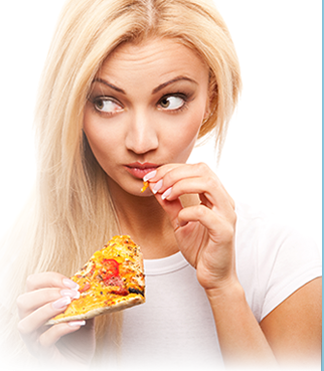 These foods include the 8 toxic foods you'll learn about in the Cleanse Food Guide. With the arsenal of delicious cleanse recipes you'll be getting you'll wonder why you even ate that group of toxic and inflammatory foods in the first place. After the initial 14-day cleanse phase, you then have the choice to incorporate some of those foods back into your diet if you wish or continue with our 8-week post-cleanse meal plan. Q: "Do I have to eat raw foods on the cleanse?" If you're already into raw foods, then this cleanse will tremendously benefit you as one of the main objectives is to alkalize your body to a much greater degree than you might be used to. Typically, many raw food diets call for heavy amounts of natural sugars in the form of dates and sweet fruit and, as such, create more toxic acid in your body. Since one of our goals is to minimize sugar intake, this cleanse will make you feel and look even better than you're accustomed to. And we've got tons of great raw recipes for you as well. Q: "Are the recipes complicated, require exspensive ingredients, or take a long time to prepare?" No, no, and no. 90% of the recipes in the cleanse take less than 10 minutes to make and require only everyday ingredients that you can find at your localgrocery store. The other 10% of the recipes take slightly longer to make simply because they require more "cooking" time. Once the inital preparation has been completed (usually a few minutes), you can simply "set them and forget them". A great example of this is our "Black Bean Chili". Q: "Are you going to sell me any detox or cleanse products?" Absolutely not! Our approach is through dietary and lifestyle improvements — not "magic formulas". Q: "Can I still do this cleanse if…"
I'm pregnant, breastfeeding, travelling, or have never done a cleanse before? If you are travelling or have never done a cleanse before, then YES you use this cleanse and benefit from it anywhere in the world - no matter if you're a total newbie or more experienced when it comes to cleansing and your heath. After all, our cleanse is going to greatly improve the health of your body - who couldn't benefit from that? Q: "Will I lose weight on this cleanse?" Most likely yes. As your body releases excess toxins, your fat cells (which store the toxins) will diminish in size. Also, because you won't be eating excessive amounts of calories you may create a caloric deficit if you're an active individual. This, in turn, will also help you lose weight. The important thing to remember is that you will lose weight while dramatically enhancing the health of your body. Q: "What if I don't want to lose weight?" That's ok as well. Most people who cleanse, while wanting to maintain their weight, might lose a few pounds (usually less than 5 lbs) of unnecessary weight that their body has been holding onto. The key to maintaining your weight on our cleanse is to ensure you incorporate regular strength training and follow our diet plan while perhaps increasing your portion sizes to consume sufficient calories. Q: "Will there be any "detox" side effects?" It depends. If you are very toxic (ie. a history of medications, frequent alcohol or caffeine consumption, if you've smoked, or a have been recently ill), then you might experience more noticeable symptoms than someone who is slightly healthier. 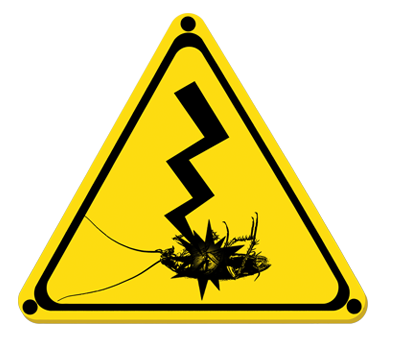 Such symptoms might include headaches, fatigue, or skin outbreaks (if very toxic). Rest assured that if you experience these symptoms, they do go away after a few days, and then the true benefits are noticed!